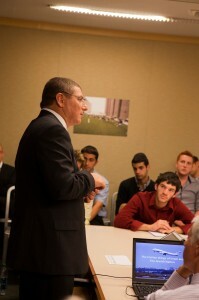 “After leading EL AL for a year and a half, I can tell you that it is a very complicated company,” said Elyezer Shkedy, president and CEO of EL AL Israel Airlines, who discussed Israel’s business climate, as well as his own professional journey, with Yeshiva University students on Wednesday, September 14. 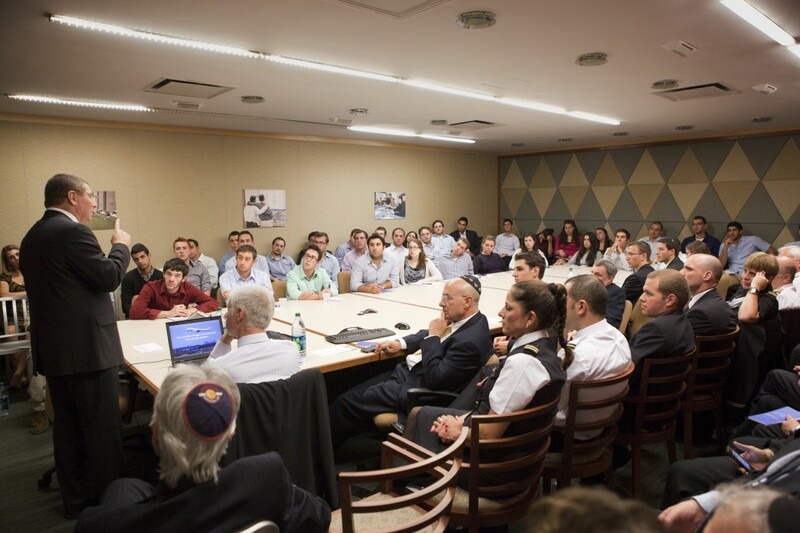 The lecture was hosted by TAMID, a student-run organization that connects American business students with the Israeli economic landscape. 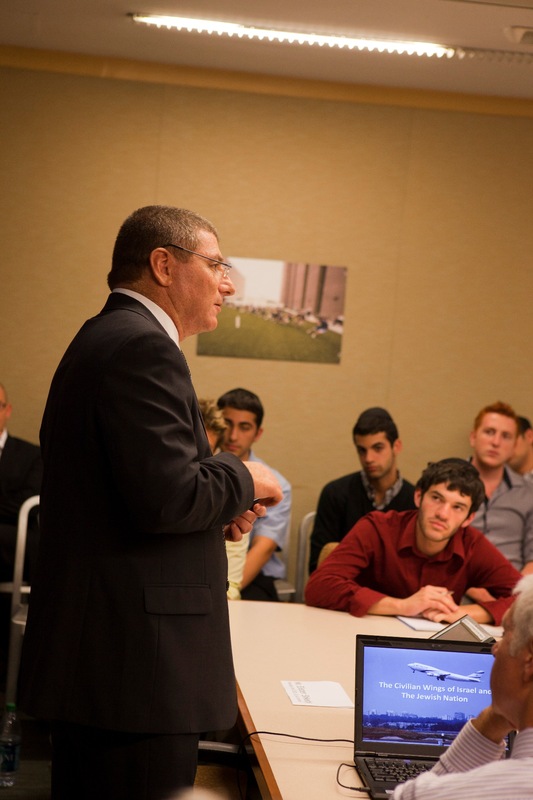 Elyezer Shkedy, president and CEO of EL AL Israel Airlines, speaks to YU students at TAMID's Sept. 14 event. Shkedy joined EL AL in January 2010 after a distinguished career of 33 years in the Israeli Air Force, earning the rank of major general. He served as commander of the Air Force from 2004 to2008 and, prior to that, was its chief of staff from 2002 to 2004. Shkedy spoke about his transition from being a commander in Israel’s air force to CEO of EL AL and the surprising similarities the two positions hold. “The main issues are the same: you have to define goals and missions, be an expert in operations, and you have to lead people,” he said. Joining Shkedy were approximately 25 EL AL employees, as well as Gil Lainer, the Israeli consul for media and public affairs for the Israel consulate general. They had all come with Shkedy because this was not only the inaugural event of TAMID’s YU chapter but was also the launching of a new initiative headed by Alon Futterman, the director of EL AL’s Advocacy Initiative for Israel (which Shkedy created) called Blue and White EL AL Ambassadors. The Ambassadors project is being sponsored by the Jewish Agency, the Stand With Us advocacy organization and the Israeli Foreign Ministry. After spearheading a similar event for Israeli high school students for Israel’s 60th birthday, Shkedy knew he wanted to create a new program for Jewish communities outside of Israel. “The Jewish nation is a very complicated nation. Kirvu L’vavot—working together and hearing each other—is one of the most important things we can do. It’s our big mission and it’s what we hope to accomplish with events like tonight,” said Shkedy.